What short course, training session or trade-show booth is complete without a spiral bound booklet to hand out to customers or trainees. We print and assemble full-color booklets, notebooks, tablets, training manuals, presentations and pamphlets with spiral bindings or comb bindings. Binding is quick and easy, and can even be done while you wait. The biggest advantage of a spiral or comb binding is that a notebook or booklet bound in this way is happy lying open on a table. Unlike stapled manuals and bound books, which are always trying to close and lose your place, a spiral-bound training manual, brochure or pamphlet is like a comfortable pair of shoes, content to wait patiently until you are ready to use it again. Notebooks and booklets come in a variety of sizes, from as little as about ten pages to a couple hundred, and from the size of a deck of cards to 8.5 x 11 inches, or even 11 x 17. They also come in many styles and colors. 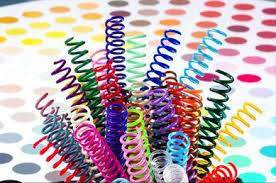 Spiral bindings come in a wide variety of sizes and colors as well. Slim booklets require spiral binding diameters as small as 6 mm, while thick books may need binding diameters of up to 50 mm. We can do spiral bindings using bright steel wire. We also provide spiral bindings in many colors of flexible, durable acrylic polymer. 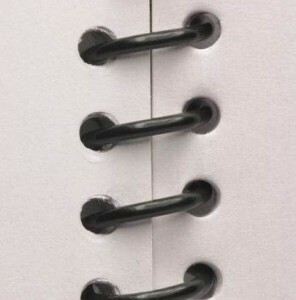 Besides spiral binding, we also provide comb binding services. 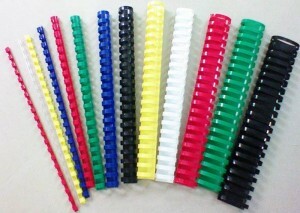 We use plastic bindings in a rainbow of colors and every diameter. A typical booklet may be created using a presentation software such as Microsoft Power Point which features a page style with colored borders, edging and highlights. Both spiral and comb bindings can be chosen to match or to accent the color scheme of the pamphlet or presentation. To protect and strengthen a booklet, it is a common practice to provide a clear acrylic cover. Colored plastic covers are available as well. Bound booklets that will only be used a few times may be printed on standard weight copy paper. Reference manuals or equipment instruction manuals that must last for years, sometimes in challenging laboratory, classroom, or manufacturing plant environments may be printed on heavy card stock, and may be laminated. Spiral-bound, plastic-laminated booklets printed on heavy stock are rugged, durable, easily cleaned, and last practically forever. Bring your next booklet to Streamline Print & Design for quick, friendly, professional binding service. Call us at 816-459-7552 or email from our Contact page.